Yahweh’s Harvest Time, a new song by The House of Yahweh reveals great things to come. The Great Feast of Passover and Unleavened Bread, is only three weeks away. The “Sons of Yisrayl” stepped onto the stage today to present a one-of-a-kind service – one that will be forever recorded throughout history. The Solar System presents Yahweh as the Greatest Servant of all. He maintains the planets in their respective orbits, thereby protecting the earth and the inhabitants of the earth. The Two Witnesses fulfill their prophetic offices, and as Scripture states, there will be no work of Yahweh unless it is prophesied in advance. How can we be delivered from nuclear war, famine, disease, and natural disasters that are prophesied to destroy 4/5ths of the world’s population? Call upon Yahweh’s Name. The New Moon is expected to be sighted on 3/21/2015 and we are reminded to look for it in fulfillment of scripture, knowing this is a practice for all eternity. Be thankful – do not lose our blessings. Therefore, do not murmur or complain. To keep the Sabbath Day holy we must learn to rejoice. Yes, we will have tests and trials but Yahweh will not allow us to be tempted more than we can bear. A Ted Talks video clip reveals that gut microbes affect people’s behavior. Eating clean foods is even more important than we realized. Yahweh will provide protection, which refers: to a cover, to keep from harm, to guard, to aid, and for safety. We must take on the Armor of Yahweh – the Laws of Yahweh and the Book of Yahweh, to receive Yahweh’s promises of Eternal Life, the white stone of acquittal, health, and so forth. Enter through the narrow gate, The House of Yahweh, to find the peaceful place we want to be. We must be obedient to have Yahweh’s Shadow of Protection. The authority of the Righteous cannot be purchased; therefore, the wise will not put their trust in riches. We can overcome all sin by overcoming evil with Righteousness. 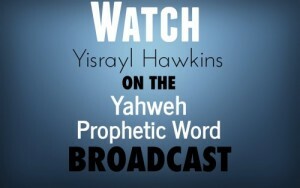 In conclusion: We can be rich in knowledge through The House of Yahweh publications.